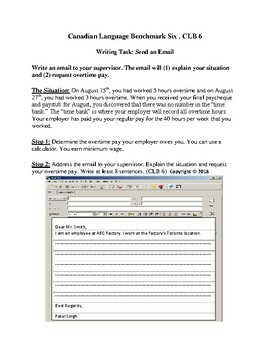 Ideal for the multi-level LINC or ESL classroom, this bundle contains two differentiated tasks (CLB5 and CLB6) on writing an email that allows the multi-level classroom to work on the same task while each learner receives a task that meets the Canadian Language Benchmark criteria for their CLB writing level. 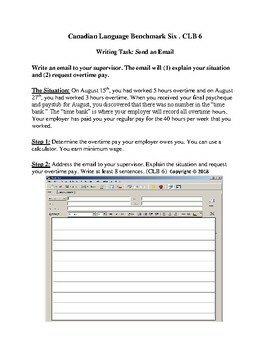 The Send an Email Task is also available to be purchased individually for CLB5 and CLB6 from this TPT store. These CLB5 and CLB6 writing tasks come ready to print and distribute to your CLB5 and CLB6 learners. 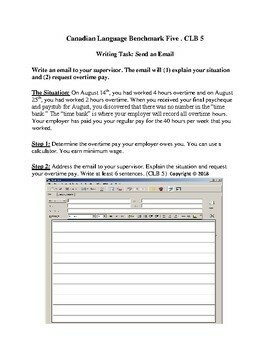 These writing tasks will allow you to informally assess the vocabulary knowledge and writing abilities of learners based on email style writing and writing for work purposes. Please ensure that you have done a lesson on sending / writing an email and learners have had prior practice writing for work purposes. (Examples of vocabulary to have covered prior to task: Dear Sir / Madam, Dear Mr. Smith, Dear Ms. Jones, Regards, Best Regards, Kind Regards).